These days there appears to be almost nothing that all, or nearly all, Americans can agree on. But this week, fully 90% of the public said that they were hearing mostly bad news about gas prices. That might seem like a no-brainer given the recent surge in gas prices. 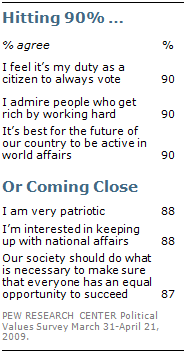 But reaching the 90% threshold is a rare occurrence in public opinion surveys. In part, this reflects the tendency of polling organizations to focus on current issues about which there are often considerable differences of opinion. Nonetheless, even on issues where one would expect to find near-total agreement, the public’s views are far from unanimous. It is highly unusual when even 80% support (or oppose) a politician or a policy. George W. Bush’s job approval briefly passed 80% in the months after 9/11. So too did Bush’s father’s shortly after the first Iraq war. Bill Clinton’s ratings never broke 80% (they reached 71% twice in 1998) while Barack Obama’s have never reached 70%. The proportion saying they are very patriotic has varied by just four percentage points (between 87% to 91%) across 13 surveys conducted over 22 years. Similarly, in May 1987, 90% agreed with the statement: “Our society should do what is necessary to make sure everyone has an equal opportunity to succeed.” This percentage has remained at about 90% ever since (87% in the most recent political values survey). And some sentiments might be considered wishful thinking. Just because nearly all Americans say it is their duty to vote does not mean they always make it to the polls. Voter turnout falls well short of 90%; in last year’s midterm election, only about 40% of eligible adults actually voted. Attitudes about equal opportunity for all, a citizen’s duty to always vote, patriotism and the other statements described above have changed little over time. On other statements, 90% (or nearly that number) agreed at one time, but no longer. These statements are hardly controversial, yet they draw less overwhelming agreement now than in the past. 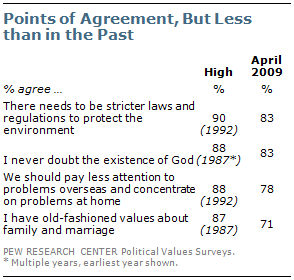 In June 1992, 90% agreed that “there needs to be stricter laws and regulations to protect the environment.” But that percentage slipped to 82% two years later and stood at 83% in the most recent political values survey in 2009. The vast majority of Americans continue to express an unshakeable belief in God. But the percentage saying they never doubt God’s existence, which remained rock solid at about 88% from 1987 through 2002, declined a bit to 83% in 2007 and 2009. There has been a larger decline in the percentage of Americans agreeing that they have “old-fashioned values about family and marriage.” In the 2009 political values survey, 71% agreed, down from 87% in the first such survey in 1987. When Pew Research political values surveys began nearly a quarter-century ago, it was inconceivable that anywhere near 90% of Americans would accept interracial dating. 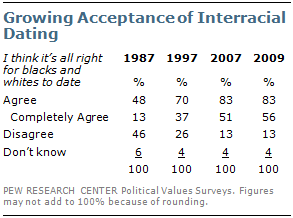 But the proportion agreeing that “it’s all right for blacks and whites to date each other” has increased from 48% in 1987 to 70% in 1997 and 83% in 2007. That figure held steady at 83% between 2007 and 2009. But there is a possibility that public acceptance of interracial dating could increase further because, as we pointed out in the 2009 report, “long-term trends in opinions about interracial dating show the strongest support among the youngest age groups.” In 2009, 93% of those younger than age 30 – -and 85% of those ages 30 to 49 — endorsed interracial dating. This suggests that in the not-too-distant future, an issue that once evenly divided the public may be accepted by nearly all Americans.